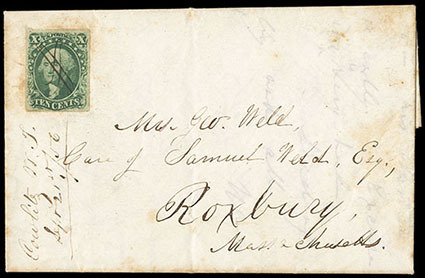 Rhode Island Express Mail, group of 10 covers and four receipts with labels, includes blue "Kinsley's Express, Newport R.I., Jun 1, 1868" double-circle datestamp on cover to Canton Mass., 1850 San Francisco Cal. letter to Providence endorsed per "Adams & Co. Express", "Per Earles Express" endorsement on 1852 folded letter from Boston to Pawtucket, 5 Ross Express usages with various ratings, purple Harnden Express Providence envelope sent locally, receipts include New York & Boston Despatch Express Company black on yellow label, 1889 "By U.S. Ex. Co." brown on white label, 1897 "Ship This Order by Carry's Newport Express" handstamp, and 1881 purple "Return Goods by New York & Boston Despatch Express Co., Boston" circular handstamp, etc. ; some faults, F.-V.F. Rhode Island Inbound Colonial Mail, 1742-1786, group of 18 with mostly Vernon, Brown or Ward correspondence mail to Newport or Providence, including 1742 "B 1/2" to Newport, 1743 "B 2/4" to Newport, 1748 "Bo 2/4" to Newport, 1749 "NY 2" ms. postmark to Newport, 1749 "Bo 7/" to Newport, 1767 "New/York" two-line postmark and "3.8" rating to Newport, also folded letters without postal markings, etc. ; some mixed condition, F.-V.F. group. 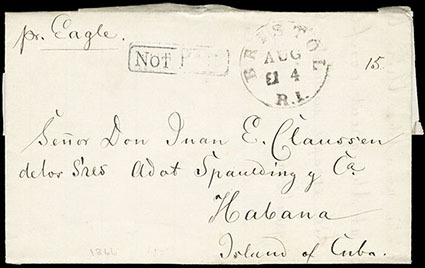 Rhode Island Inbound Mail, 1792-1800s, group of over 36 covers including some better, note 1789 "Baltimore. 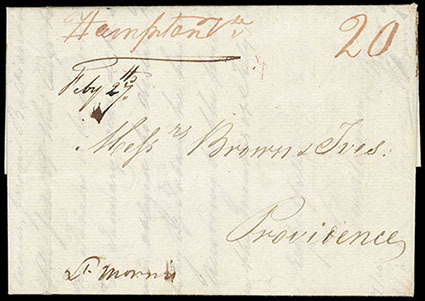 May 9" straightline to Newport, 1792 "Alex, Feb 3" straightline and "6.16" rating to Providence, 1799 "New York" clamshell postmark to Providence, 1806 "N London" fancy red cds with ornament and "Paid" handstamp to Providence, 1838 "Galesburgh Mich." postmark to Tiverton, 1811 "Hampton Va." red ms. postmark with "20" rating to Providence, "Natcz. M.T." cds on 1817 folded letter to Providence, 1829 "Taunton. Ms. Aug 24" straightline to Newport, 1844 "Apalachicola F.T." red cds with matching "25" rating handstamp to Providence, 1815 "Alexa Ca" with red ms. "30" war rating to Providence, 1860s Civil War soldier letters (3), and 1830s Express Mail from New Orleans and Charleston (1), etc. ; some faults, F.-V.F. 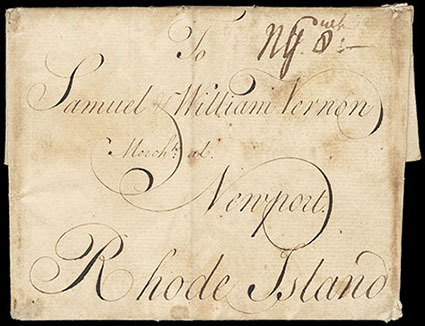 Rhode Island Incoming Ship Mail, 1794-1800s, better balance of 39 covers including 1811 "Norfolk Va.," cds and red manuscript. 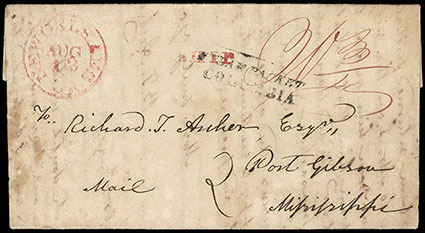 "Sh 27" rating from Liverpool to Providence, 1823 "Salem Ms." red cds and "Ship" handstamp rating "12" from Italy to Providence, several New York clamshell postmarks including 1801 "Sh 30" from Bordeaux to Providence and 1803 "Sh 19" from Suriname, 1794 "Balt * Dec 16" straightline and "Sh 48" rating from Copenhagen to Providence; 1809 "Portsmouth, N.H., Octr 31" two-line postmark with small "SHIP" handstamp and "14½" rating to Providence, 1833 prices current from Havana with "Norfolk Va" red cds and "Ship" h.s. 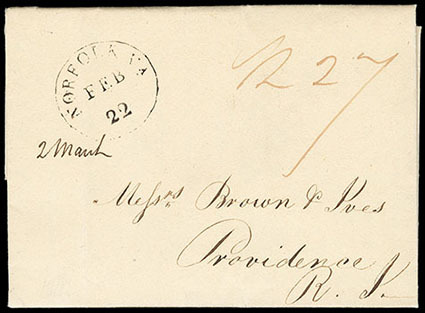 "27" rating to Providence, 1839 "Sag Harbor" red cds and "Ship" handstamp with "20¾" rating from Java to Providence, etc. Rhode Island Incoming Steamship Mail mostly from Cuba, 1850s-60s, group of 17 with various steamship rate markings inc. "10", "Steamship 10", "Steamship 20", "Steamship 30 Cts" and "N.Y. Steamship 10" cds etc., note steamship endorsements of "Columbia", "Morro Castle" and "Eagle", note 1857 "R. Morison & Ca., Havana" blue forwarders handstamp, and includes 1866 Bristol R.I. to Havana with New York "Not Paid" framed handstamp and ms. "15" due rating, etc., F.-V.F. Rhode Island Related Postal History and Collateral Balance, 1708-1800s, eclectic group including 1708 Rehoboth Bristol County letter ordering selectmen to obtain a grammar school, 1758 Newport folded letter to Portsmouth (PFC), 1785 Newport whaling letter, 1773 N.Y.C. 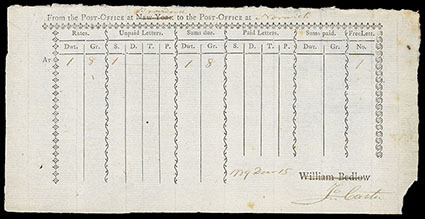 Post Office bill to Newport, 1789 Providence post office bill to Norwich, 1805 Promissory Note from William Hunter (R.I. Senator 1811-1821) to John Linscom Boss Jr., 1856 Post Office draft on the Postmaster of Fall River to pay Old Colony & Fall River R.R. $800.52, 1762 "Fort tanwix" letter from "Committee of Wr for ye County of Bristol", etc. ; some mixed condition., F.-V.F. (Texas) Forwarded by the Texas Express Company from Houston, Texas, black on orange label, affixed on buff legal-size court house cover to Governor E.J. Davis, endorsed "Election Returns, Harris County Texas" at top left, Very Fine and unlisted label in Mosher. 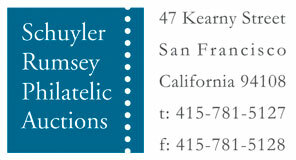 This label is from a new find and is unlisted in Mosher. Governor Edmund J. Davis at Austin, Texas served from 1869 to 1873. Davis was accused of election irregularities, so ironically this cover contained election returns from Harris County and is marked "O.K.". (Texas) "Velasco, July 21st 1838", dateline on folded letter to Port Gibson Miss. with "Sam. Ricker Jr., New Orleans Agent of the Texian Post Office" oval agent backstamp and black "Steam Packet Columbia" two-line handstamp (Milgram 266), entered mails with red "New Orleans La., Aug 12" cds and matching "Ship" handstamp with red ms. "20¾" rating for 18¾¢ postage plus 2¢ ship fee; light overall toning, a Very Fine use. During the period of the Texas Republic 1836-1845, a regular service between Galveston and New Orleans was operated with an agent based in New Orleans for the "Texian Post Office". One of the vessels providing the service circa 1838-42 was the Columbia, a 140 ton side paddle steamer built in 1835 at Cincinnati Ohio. This letter was surely brought down the Missouri-Mississippi rivers to New Orleans by steamboat. At New Orleans, Ricker sent it by the Gulf steamboat "Columbia", either via Galveston or Brazos. 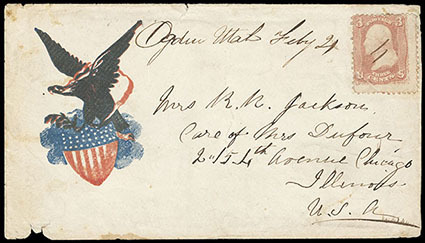 (Utah) Ogden, Utah, Feby 21, manuscript postmark on patriotic cover to Illinois, franked with manuscript cancelled 1861 3¢ rose, attractive red, white & blue Eagle & Shield patriotic design, cover with small nick at bottom left, Very Fine, a very rare patriotic used in Utah. (Washington) Cowlitz, W.T., Sept. 21, '56, manuscript postmark on folded cover to Massachusetts franked with four margin 1851 10¢ green, type II (manuscript canceled, trivial corner crease), light toning at right and around adhesive, Very Fine, Letter mentions the Military Road going to Portland. Post office opened in 1854 and closed in 1906.